Another bushel of questionable potatoes have infiltrated the PlayStation 4. Not so long ago I wrote about the first game in the Holy Potatoes! series. Today I have the honor of introducing you to Daylight Studios’ second carb-loaded adventure, Holy Potatoes! We’re in Space?! Sisters Cassie and Fay are on a mission to find their Jiji. Starting off with a shabby yet serviceable spacecraft and a tiny crew, these potatoes will have epic battles, meet some familiar faces, and get themselves into a jam or two along the way. These intrepid space spuds have galaxies to explore and you’re going to be the invisible hand that guides them. The bulk of We’re in Space?! is spent exploring planets for resources and partaking in epic space battles. These turn based events have you spend generated Charge (aka action points) to fire weapons until you’ve destroyed the enemy. The base ship starts you off with two weapon stations as well as a shield. The shield can be moved to protect the hull or one of your active weapons. Keeping an eye on the health of your weapons is extremely important; they cannot be replaced during battle, so once they are destroyed you are [expletive] out of luck. It is important to both listen to and make use of your captain. Each captain has special abilities you can call upon during battle. If you plan these right, you can turn the tide in battle. Some will buff or debuff ships, others offer attack bonuses. It’s good to change up who is controlling the ship from time to time. As you progress your captains learn new skills, highly beneficial as the difficulty level increases. So what happens when weapons are destroyed? Once an Exploration has been finished, you’ll have some free time to manage the spacecraft. Visit the workshop next to the deck and use your resources and blueprints to craft more weapons. Sometimes you’ll acquire blueprints as part of your battle winnings, other times through an event on the planet. But if in doubt, you can always purchase some by visiting your current galaxy’s Hub. 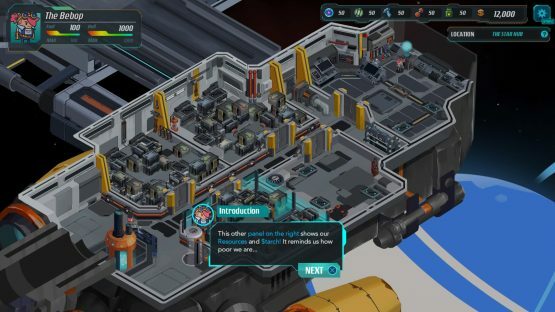 Any crew member can be assigned to the workshop, however crew that specialize in crafting have the chance to build a better weapon than others. 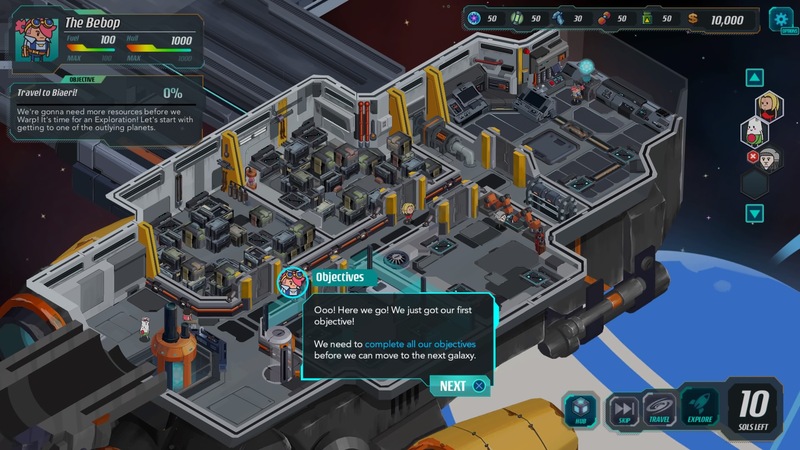 Once your weapons are built, return to the bridge and assign them to one of your stations. You’ll also need to select a crew member to operate them. Everyone has a different proficiency, so if you can, try to match laser weapons to laser specialists, shrapnel to shrapnel, etc. These perfect matches will give you bonuses like increased weapon health or damage. Let’s talk some more about the Hubs. You’ll be making frequent trips here to refuel and have the hull repaired (both done automatically as you dock). 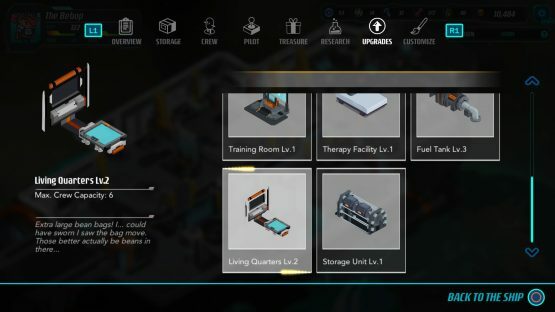 There are four areas for you to visit while you’re here: the weapon shop, the resource shop, the ship upgrade vendor, and the local watering hole. Since I’ve already touched on the first two, this section is going to focus on the others. There’s no beating around the bush; Cassie and Fay’s ship needs upgrades. Visiting the ship vendor you can spend your hard earned $tarch on things every ship needs, like a stronger hull, better fuel tanks, and extra beds for the crew quarters. Every time you warp, the game gets a little harder, the enemies tougher, their ships stronger. Gaining access to better blueprints also means they’re going to require more Charge. Shop smart, shop Spud Mart. Invest in these upgrades and become the best spud captain out there. A ship is only as good as its crew, so it is important to employ the best of the best. When you stop by the Hub for repairs and shopping you should check on the unemployed potatoes. Granted you have empty beds on board, you can hire additional staff. That means more taters to man your stations and more hands to build your arsenal. 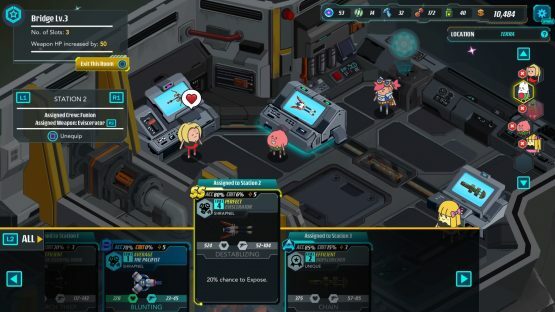 When you only have four crew members it’s difficult to perform extra tasks like R&D or learning new skills. Adding in a couple new faces will allow you the opportunity to let your potatoes flourish. But if someone isn’t working out for you, kick them to the curb! 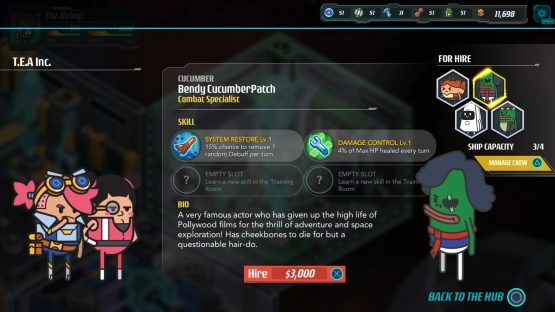 Make room for the jobless Bendy CucumberPatches. You may notice members of your crew sporting negative status effects. This happens if their station is destroyed during a trip to the surface. Send those mopey faces to the Therapy room. It will take a Sol or two for them to regain their perky demeanor but every captain needs a healthy crew. Exploring planets in Holy Potatoes! We’re in Space ?! is super important. Yes, you need the loot from blowing up ships, but the humor and over the top parodies are just as fantastic as ever. Encounters with space travelers like Dr. What and my favorite blue anime cat are just some of the entertaining bits you will come across. If you play your cards right, you can convince them to join your crew. Holy Potatoes! We’re in Space?! sticks to its strengths, keeping true to their time management roots and nailing those parodies. That tutorial battle took me a little longer than I thought it would, but eventually I got the hang of it. There was some trial and error during the first mission as I had to switch my brain from thinking this was A Weapon Shop?!. But once I put on my Mal Reynolds suspenders, it was smooth sailing. Now I’m the best damn pilot in the galaxy, zipping all over the place blasting baddies out of the sky. I even have a furry sidekick. This could be your life, too, since Holy Potatoes! We’re in Space?! is out now on the PlayStation 4. Holy Potatoes! We’re in Space?! review code provided by publisher. Version 1.02 reviewed on a standard PlayStation 4. For more information on scoring please see our Review Policy here.